This underrated retelling of the Wyatt Earp story features the grim James Garner (see also Duel at Diablo and A Man Called Sledge), not the comic one with the easygoing charm. Garner plays Wyatt, paired with Jason Robards as an excellent Doc Holliday—more believable as the tubercular gunfighter than the physically robust Kirk Douglas and Victor Mature in previous film versions of the story. The Earp story has been more successfully retold in movies than any other from actual western history, with varying levels of accuracy. The best cinematic version of the Earp story may be Tombstone, although My Darling Clementine, one of the older and least historically accurate versions, has its proponents. Hour of the Gun belongs in this more than respectable company. 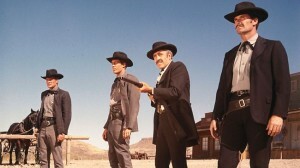 In fact, gritty thriller writer George Pelecanos, who says that westerns are his favorite film genre, claims Hour of the Gun as his favorite western, as the upright lawman Earp becomes a colder and more implacable killer in hunting his brothers’ murderers (interview on NPR’s Morning Edition, October 9, 2009). Pelecanos points to the excellent Jerry Goldsmith score as one of the movie’s overlooked strengths. The cinematography by Lucien Ballard is also terrific. Edward Anhalt wrote the screenplay; he shows up briefly in the film as Doc Holliday’s doctor. This was director Sturges’s second telling of the Earp story, a decade after his earlier Gunfight at the O.K. Corral. In the meantime, he’d made The Magnificent Seven, The Great Escape and The Hallelujah Trail, and he was at the peak of his game. He was one of the best directors of his time in dealing with large-scale stories and action, but this is a more modest effort in terms of scope and budget. 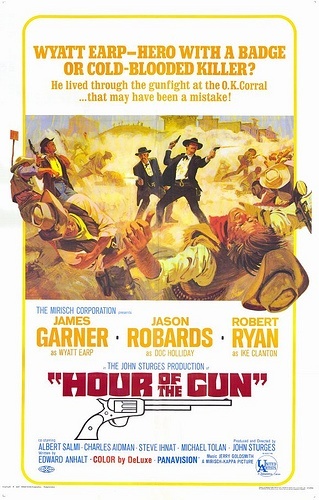 While Gunfight goes with its title and builds up to the legendary battle, Hour of the Gun starts with the gunfight and focuses on Earp’s subsequent vendetta ride, as he hunts down those he holds responsible for gunning down his brothers. In telling this story, it keeps more to the historical facts than the older film did, but only to a point. Much of the dialogue in the courtroom scenes, for example, is taken from actual transcripts. Text on screen after the initial credits says, “This picture is based on fact. This is the way it happened.” Well, not quite, but it’s closer than previously filmed versions of the story. The Earps and Holliday at the OK Corral. In his 1967 review of the film, Roger Ebert called this one of Garner’s best performances. The casting is one of the film’s strong points, especially in the three primary roles: Garner as Earp, Robards as Holliday and Robert Ryan as an older and more cerebral Ike Clanton than we usually see. Robards is good as Doc, although he’s significantly older than the actual historical character. He mentions having killed during the Civil War, but the real Doc Holliday was much too young to have fought in the war. The Earp brothers (Virgil and Morgan) are not terribly memorable in this version of the story. Look for a young John Voight as Curly Bill Brocius in an early role. Interestingly, there’s no Johnny Ringo in this version of the story. And basically there are no women in this story, either. Because of its focus on Earp’s search for revenge, the movie becomes more melancholy as Doc tries to keep Earp balanced. Doc: “I know you. You can’t live like me.” “Those aren’t warrants you have there. Those are hunting licenses.” Earp comes to realize the ultimate futility of revenge past a certain point. The vendetta itself is not celebrated as much as in Tombstone. The film’s climax shows Wyatt shooting it out with Ike Clanton in Mexico, which is not at all the way Clanton died. The end of the movie, with Doc dying in a Colorado sanitarium, is heart-wrenching. Wyatt says he’s going back to Tombstone as the U.S. marshal, so Doc will think he’s regained his idealism and respect for the law; in fact, he intends never to be a lawman again. The irascible dentist-gunman forces Wyatt to leave and sits playing cards with an orderly on an outdoor veranda as Wyatt drives off in a buggy. The poster emphasizes the revisionist elements of the film. Since the movie presented a revisionist view for its time of a famous western lawman, audiences weren’t sure what to make of it when it was released. But it stands up pretty well more than 40 years later. 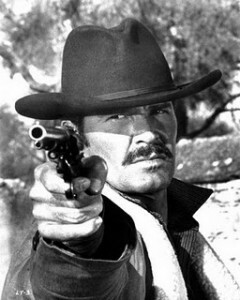 Garner would play Wyatt Earp again in Blake Edwards’ 1988 comedy-thriller Sunset. In Sunset, Garner is an aging Earp during the period of the late 1920s when the former lawman was in Hollywood advising on westerns, paired with Bruce Willis as Tom Mix. This entry was posted in 55 Greatest Westerns and tagged Adventures in Mexico, Edward Anhalt, James Garner, Jason Robards, John Sturges, Lucien Ballard, Town Taming, Wyatt Earp on August 30, 2013 by Nicholas Chennault. Good write-up! This makes me want to see the movie.